4/1/18: The State of Our City is Strong! The best part of the annual State of the City address was when my 9-year-old son Oliver Blakespear made that declaration at the end. 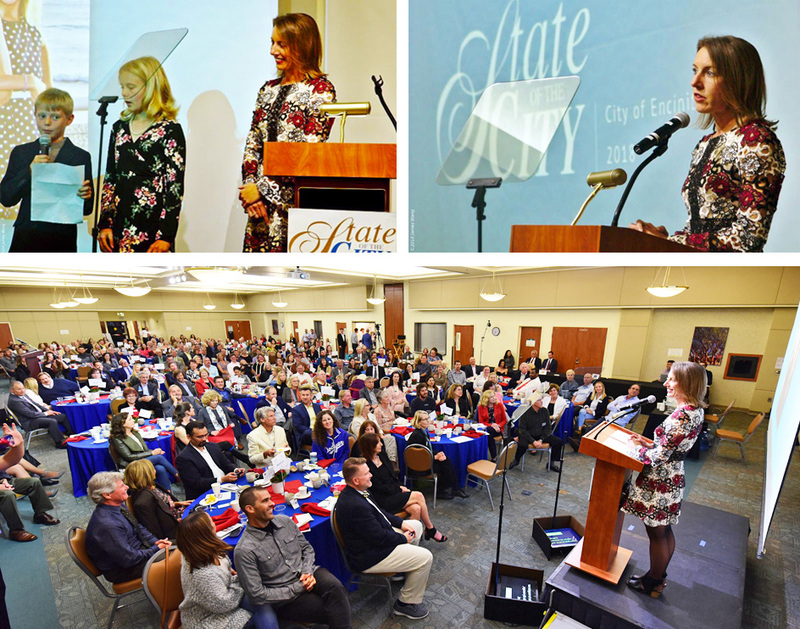 The State of the City, hosted every year by the Encinitas Chamber of Commerce at the Encinitas Senior and Community Center, is a great opportunity to reflect on the big picture, enjoy food from local restaurants and accomplish efficient community networking! Please consider joining us next year if you missed this year’s festivities. And thank you to the Chamber and the Solana Center for helping make it a zero-waste event again this year by stationing youth volunteers at trash cans to help separate food, recycling and waste. Mayor Addresses Key Initiatives at State of City Event in the San Diego Union-Tribune. The link to video of the event isn’t available yet. Joe Mosca for City Council! 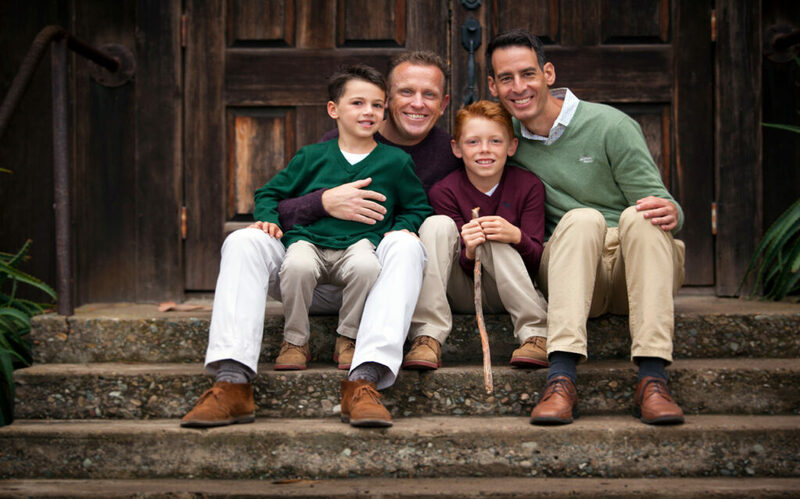 Deputy Mayor Joe Mosca (at far right) and his husband Matt, and two boys, Devan (left) and Garrett (right). Please join me in supporting Deputy Mayor Joe Mosca to continue his service on the Encinitas City Council, representing District 4. He will share his thoughts and perspective at a campaign kickoff on Sunday, May 6, from 2-4 p.m.
You can RSVP here, on Facebook, or RSVP via email to Mosca4Council@gmail.com to receive the address for the event. Deputy Mayor Mosca has been a great colleague on the City Council since his appointment last year, and I heartily endorse his campaign for a richly deserved full four-year term. He was initially chosen by the Council from among 17 applicants to fill the remainder of my Council term when I was elected mayor. Joe brings a thoughtful and collaborative approach to the job. He genuinely enjoys digging into residents’ problems and figuring out solutions. His past background in elective office, which included five years as a councilmember and mayor in Sierra Madre, California, has allowed him to immediately understand the workings of this city’s government and effectively advocate for community improvements. Joe’s campaign kickoff will be a great opportunity to get to know him. If you’d like to support Joe, but can’t make the event, please consider donating to his effort here. And finally, I’ll leave you with this spring celebrity sighting during yesterday’s egg hunt at the Encinitas Community Park! 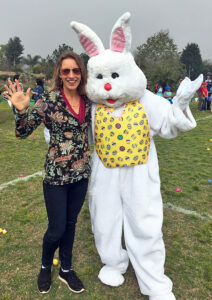 If you celebrate Easter, Happy Easter to you and your family!